This packed-to-the-gills essay teaches everything about the Japanese sword, from its connections to Buddhism and samurai to its metaphorical role. 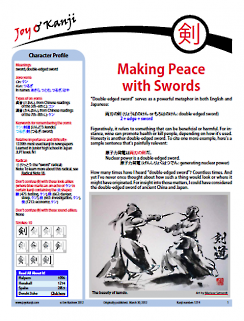 You'll learn how people use 剣 and 刀 quite differently. Fantastic photos provide glimpses of sword-bearing martial arts, supplementing the discussion of kendo. In one quiz, you'll even consider which animals come equipped with swords! August 3, 2012: Fixed a link. April 10, 2012: I changed the definition of 呑 from "to drink" to "to swallow" in Quick Quiz 1.